Every autumn the urban area inscribed by 12th and 6th Avenues + W 14th and W 34th Streets—New York’s Chelsea district—offers up its fall programme to art lovers thirsty after summer’s annual drought. At this time of year, Saturday’s order of the day becomes promiscuous trysts amongst partners like Marianne Boesky, Galerie Lelong, Andrea Rosen Gallery, and Mary Boone Gallery. Depending on the gallery’s stamina, each encounter might last between 7 and 20 minutes. Paused by lunch at Pepe Giallo and ending with refreshments at The Half King, gallery-goers return home well sated, visually and gastronomically. In the wake of the tumult that Hurricane Sandy recently waged on this internationally important art district, my tour back in late September has taken on uncanny prophesy. 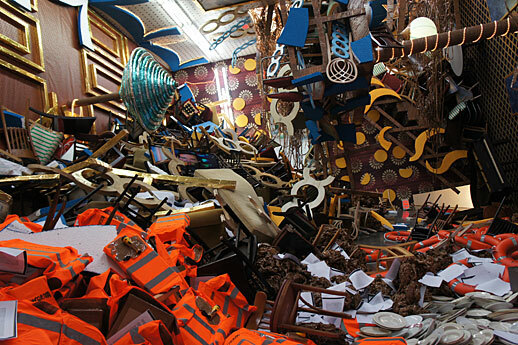 Thomas Hirschhorn’s upended ship hull at Gladstone Gallery and Rosemary Laing’s sky-born trees gripping half-built houses now seem to have forecasted the impending deluge. Reading Jerry Saltz’s sobering account of flooded ground level galleries and the reticent discarding of unsalvageable, water-logged art reminds me that Chelsea remains a unique environment where commercial enterprise abuts critical engagement. Moreover, a dialogue surrounding artwork that is indulgent, as is sometimes presented by superdealers like Larry Gagosian, has a place among discussions of more compelling work. Gagosian’s latest offerings are so nastily “blue chip”, the folks at the Dow Jones are knee deep in drool. The poker-derived term, coined in 1923 by the Dows’ Oliver Gingold to mean high-value stock, has taken on an adulterated meaning in the world of art, wherein the nouveau riches, profiting off of the 400% rise in oil prices, now have their own category of aesthetic commodity. Gaudy and decorative art. Richard Phillips, whose over-sized paintings of actresses Lindsay Lohan and Sasha Grey were on view last month, is an archetypal example of this trend. Aiming to reorder the relationship that Pop Art bears with its subjects, Phillips does successfully employ a David Hockney-an colour palette, the former’s bright aquamarines plasticizing each actress’ taut flesh while conjuring banner moments in art history such as the first exhibition of “A Bigger Splash” in 1967. However, looking at the artist’s statement, it is clear to me that Phillips is counting on the seductive power of his lubricated words—a slipperiness mimicked by the superficial appeal of his paintings—to disguise utter nonsense beneath. The statement asserts that “when we can’t determine what art is—when we get to that point where we’re not sure, that’s the strongest likelihood that we’re actually experiencing something great.” If uncertainty and lack of understanding are equivalent to valuable artistic experiences, then pursuing knowledge of any sort seems rather counter-productive. Better to describe it as sculpting maverick Maskull Lasserre did in a recent Canadian Art interview: “…it’s the things that are unclear but resonate, those are the ones that need to be coaxed along and developed.” I find the over-painted, airbrushed aesthetic of Phillips’ celebrity subjects to be as resonant as a block of cheese. But that is just me. Phillips also erroneously claims that the films included in his current show are meant to be destabilizing art works of the film noir genre. “First Point” (2012), running just over five minutes, oscillates between melodramatic footage of Lohan stumbling feverishly through a dark nightscape and cuts of pro-surfer Kassia Meador—working as Lohan’s body double— virtuosically hauling pipe. Very little about Phillips’ cinematography is aesthetically appealing, despite tutelage by veteran surf filmmaker, Taylor Steele. Critical concern, however, truly reaches a fever pitch at the conceptual level. The audience is expected to be affected by Lohan’s performance as a “nightmarish noir person” , this cinematic identity apparently registered by the wild-haired dame’s panicked promenade through utter darkness, looking back over her shoulder in consternation every ten seconds. Between these two sorts of segments are slow-panning shots of the blond actress, either supine on the beach or standing, eyes scanning some distant wave, in a rash guard. Phillips’ hope to capture self-conscious recognition and harness the potential of narrative action ultimately results in banal film-making. None of the subjective psychological foray intrinsic to film noir is present in “First Point” and the string of sequences amount to an incoherent, vacuous anti-narrative. My suspicion is that someone should ring Phillips and remind him that a film noir shouldn’t leave his viewers in the dark. After giving pause for Guido van der Werve’s intoxicatingly romantic video installation at Luhring Augustine and passing uncommittedly through Greene Naftali’s off-balance exhibition, the afternoon’s true redemption came in the form of sculptural phenomena at Marianne Boesky Gallery. 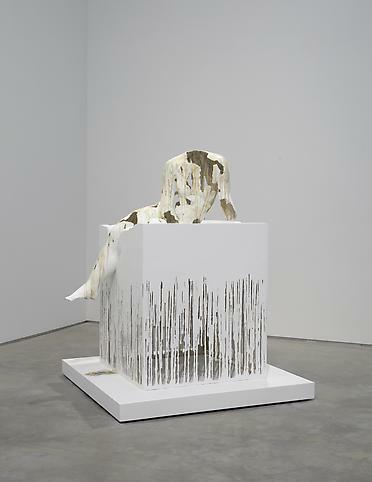 The Vanishing Point, a series of 6 other-worldly manifestations vivified by the hand of Diana Al-Hadid, meets its audience with an enigmatic synthesis of Gothic architecture, figural representation, and two-dimensional painted form. 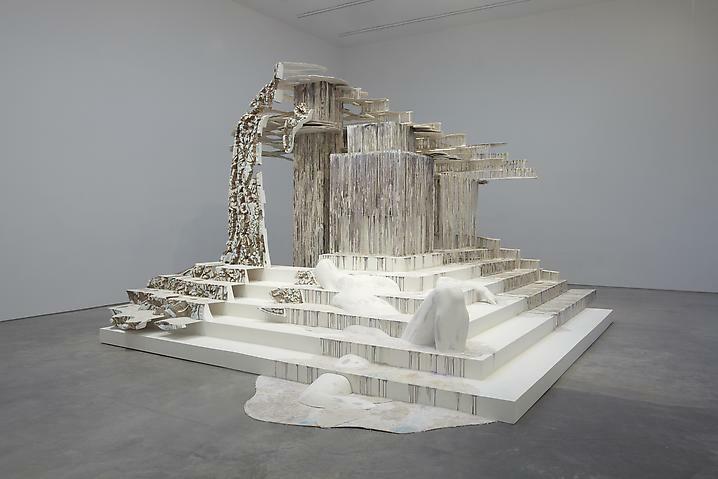 The young artist has remained on the front burner of my mind not only because her native country, Syria, has recently hosted such political turmoil but also because Al-Hadid’s geometric sculptures, perched precariously on insubstantial stalactites, have an alchemical presence that hovers between geological representation and the mythical sublime. “Suspended After Image” (2012), the largest work in the show, is a tendrillar sculpture that combines the angular elegance of the Bauhaus school with organic rhythms of figure, Arcadian landscape, and botany. Viewers witness a cleanly rendered escalation of steps interrupted by the protruding limbs of a prostrate body. Quick mental calculation confirms the Mannerist proportions of the figure, and yet, the elongation of arms and legs is nothing but pleasing to the eye. On the top landing sits a cubic structure reminiscent of Moshe Safdie’s modular Habitat project, albeit the unadorned planes of the architect’s edifice have here been replaced by the thread-like, leafless vines of climbing plants. Adding to the flora-like nature of “Suspended” are radiating lobes that look like shelf fungi, as if birthed from some grand old tree. In her latest work, Al-Hadid’s investigation of linear perspective creates an opportunity to collapse the three-dimensional fact of sculpture into the two dimensions of the art historical canvasses she is known to reference. This has allowed the artist to comfortably engage with figuration for the first time in her career. Al-Hadid is interested in not only the threshold between represented image and material referent, but also the transitional moment between states of matter. This investigation is apparent in the startling “Divided Line” (2012), a ghostly rendition of Raphael’s cartoon for the tapestry “Christ’s Charge to Peter” (1515-1516), installed as if a structural wall in the gallery’s main space. Furthermore, the conflation of line, space, and form manifests itself in “Antonym” (2012), the most prominently figural piece in the show. “Antonym” pugnaciously rejects Newtonian physics through a hollow Bronze-like figure that slowly sinks into a melting plinth, creating tension between the suggested masslessness of the subject and the weight of gravity pushing into its support. Accordingly, the brittle, delicate foundation to which Al-Hadid has entrusted the load of the entire sculpture remains unbelievably robust, in spite of the level of degradation exacted on the base. Consistent across the works in The Vanishing Point is a motivation to change states, as supports turn molten and organic matter fossilizes and turns solid. Yet no matter how calcified these seemingly ancient structures become, their final destiny ultimately results in that wonder of chemistry—sublimation—or the change of state from solid directly to gas without passage through a liquid phase. Beyond entering into dialogue with the “vanishing point” of linear perspective, an abstruse place where objects change shape, colour, size, and weight, Al-Hadid has created mementos of a vanishing past. The august edifices, mythological cities, and iconographies of art’s history here represented transported me to and through time and states of being until I felt like Gradiva myself—turning from stone to flesh and then into invisible memory as quickly as any apparition. This entry was posted in Exhibition, The Ministry and tagged Andrea Rosen, Architecture, Art, Bauhaus, Blue-chip, Canadian Art, chelsea art galleries, David Hockney, Diana Al-Hadid, Dow Jones, Film Noir, gagosian, Galerie Lelong, Gladstone Gallery, Greene Naftali, Guido van der Werve, Hurricane Sandy, Kassia Meador, Lindsay Lohan, Luhring Augustine, manhattan, Marianne Boesky, Mary Boone, Maskull Laserre, Moshe Safdie, New York City, Pepe Giallo, Raphael, Richard Phillips, Sasha Grey, Taylor Steele, The Half King, The Vanishing Point, Thomas Hirschhorn by Rachel Anne Farquharson. Bookmark the permalink.